Learn Airbrush Tanning In Just 1 Day or 1 Weekend! Discover how simple it is to start your very own profitable Airbrush Tanning Business Right Now! Download Free Report! Everything you need to start a Mobile Airbrush Tanning Business and how much money to invest. Do you want to start your own Airbrush Tanning Business, but don't know how or where to start? 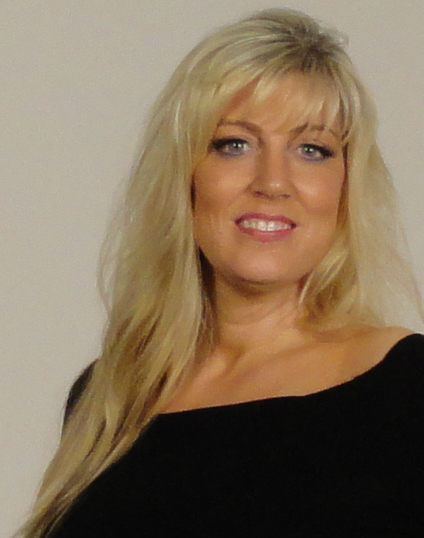 Hi…my name is Simone and I am an experienced Airbrush Tanning business owner in Los Angeles and I am also the founder and trainer of the Hollywood Airbrush Tanning Academy﻿﻿﻿. I am inviting you to explore one of the hottest and easiest to get in to business opportunity on the market. Finally you can learn a service that everyone wants in only 1 day or 1 weekend. Especially if you have no or limited business experience, are unemployed, or are a busy stay-at-home mom, the idea that you can actually set up an airbrush tanning business by yourself – one that generates income for you more quickly and easily than any traditional 9 to 5 job could - intimidates many people. It feels like there are just too many questions, too many problems, and too much time necessary...and that's all before you can even get started. Sometimes it feels like there is so much to learn before you've even started, doesn't it? Don’t worry – You are not alone! The idea of starting a spray tanning business intimidates many people. 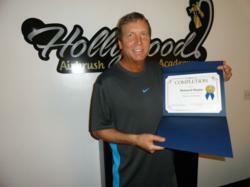 Hollywood Airbrush Tanning Academy's Training Program. 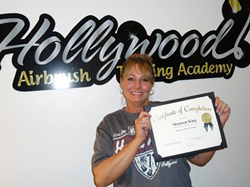 At the Hollywood Airbrush Tanning Academy, you can get trained to start your very own successful (and highly profitable) airbrush tanning business in just one session. Comprehensive on-location airbrush tanning training at your house or location where you’ll learn how to master my secret airbrush tanning techniques … even if you’ve never gotten an airbrush tan yourself! Step-by-step instructions on how to start airbrush tanning like a pro in just hours … you’ll discover exactly what you need to know to create perfect natural tan for any special event, including weddings, TV appearances, fashion shows, and bodybuilding competitions. Advanced airbrush tanning tricks that are super simple to learn, but that only a handful of tanning specialists in the world know … these tips and tactics alone will guarantee your customers come back again and again! Extensive review of the best (and most affordable) equipment you will need to get started, including your airbrush gun, tanning tent, formulas, and more. 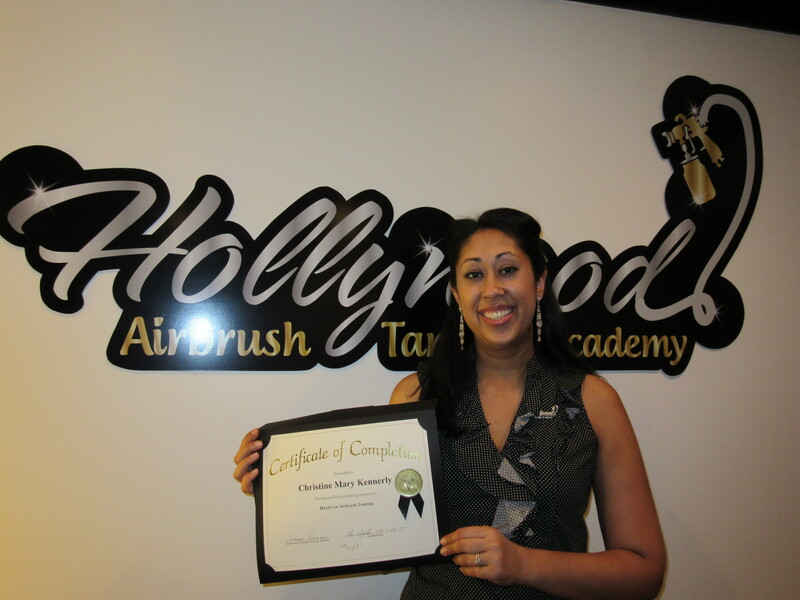 Get trained by a certified and experienced Airbrush Tanning Technician and wildly successful business owner. At the Hollywood Airbrush Tanning Academy, you’ll get everything you need to know to become the hottest airbrush tanner in your town, guaranteed (more about my unique guarantee in a moment). I learned so many important things! It includes safety and ventilation, paying attention to each client’s skin type and mastering Simone's technique. Entering this industry with little knowledge outside of personal tanning, I knew I had picked the right instructor. After meeting Simone and participating in her class I no longer have any doubts in my airbrush tanning abilities. I attended the best airbrush training class in the world and am thankful to bring that knowledge and skill here to Alaska. I learned so many great and important things from Simone during this course. The most important topic that I left with is safety of myself and others. I have not seen much teaching on safety when it comes to spray tanning and I think it should be addressed with anyone learning this skill. Another very important benefit that I walked away with is the application process that Simone teaches is truly one of a kind and makes you stand out from all the rest. The Airbrush Tanning Industry Is Booming…Start Your Business Now! The airbrush tanning industry is booming. Airbrush tanning was made popular by the TV show Sunset Tan. Once reserved for models and Hollywood celebs and only found in high-end salons and spas, now airbrush tanning businesses are everywhere. With lighter and more portable equipment, motivated individuals are running airbrush tanning businesses from home, renting space in local spas and gyms, and creating mobile airbrush tanning businesses that service their clients at their own homes. In the past few years alone, airbrush tanning business owners are seeing shocking growth. And, that explosion doesn’t show any signs of slowing. With more and more research demonstrating the increasing dangers of sun tanning, dermatologists, the FDA and the Skin Cancer Foundation now recommend airbrush tanning as the preferred solution. In addition, new studies are revealing the potential hazards of tanning beds, the popularity of airbrush tanning will only continue to skyrocket. Especially since consumers can get the same tan results in one 10-minute session that would previously take five tanning bed sessions or many hours in the sun to achieve. In fact, ever since the government added tanning taxes to people who use tanning beds, the demand for airbrush tanning technicians has increased exponentially (The government implemented this because statistics show a high growth of skin cancer in younger people). Plus, since airbrush tanning is UV-free and doesn’t expose people to harmful UVA and UVB rays as does traditional sun tanning, more and more consumers are making the smart choice to choose airbrush tanning over all other methods. What’s this mean for you? It means this is a great time to start your own airbrush tanning business, of course. I can’t, of course, guarantee how much money you’ll make … but I can say that I am making a great living as a Airbrush Tanning Technician. How great? Well, during the spring and summer months, I regularly have up to 15 customers a day. What’s that mean in terms of dollars and cents? You can do the math: With 15 customers, I can consistently make between $675-$1125 in just one day, plus many customers are so happy about their results and happily offer additional tips. During the non-summer months, seeing up to five customers a day is my norm. I think you’d agree that making $225-$375 isn’t too shabby for 50 minutes of work, right? Especially if you’re a stay-at-home mom or are just looking for part-time cash, this career gives you plenty of flexibility and free time to do whatever you want! Plus, with such continuing high demand, even bigger profits can add up fast. It’s not hard to start imagining everything you could do with all that extra money, is it? Be Very Careful When Choosing An Airbrush Tanning Training Program! With the popularity of airbrush tanning growing so quickly, there are many airbrush tanning training programs popping up across the country. Make sure the training program is taught by a successful and experienced Airbrush Tanning Technician who is actually in the business now and earning a great living from it. Many programs are run by people without any real-world business experience. As a result, you’ll never learn the real secrets to becoming an airbrush tanning pro. As successful airbrush tanning business owner myself, I am licensed and certified and have had years of experience perfecting my special techniques … and now I’m teaching them to you! Every year, I spray hundreds and hundreds of happy customers who return over and over again. Many programs entice you with low training fees but force you to buy their expensive (and usually inferior) equipment and products at a premium. Read the small print very closely. When you train with me, you will NEVER have to buy anything extra. In fact, I’ll show you exactly where you can buy your very own equipment for only a few hundred dollars. And, depending on what your business goal is (part- or full-time) and where you want to tan (e.g., at home, as a mobile business, at a salon, etc. ), I will tell you where to get the best equipment for the cheapest price. You see, I do not work for any of the manufacturing companies or solution providers. Unlike other Airbrush Tanning Trainers, I don’t get any kickbacks or commissions. Believe me, they’ve begged me to take their money. They know how successful my training business is and they want me to represent their brands so badly. But, it would be a conflict of interest for me. My goal is to make sure I’m recommending the right equipment and products to you depending on what your actual needs are, not just for me to make a few extra bucks. Make sure the program allows you to work one-on-one with your trainer AND guarantees you will get hands-on experience spray tanning at least four people in your session. 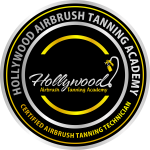 At the Hollywood Airbrush Tanning Academy, you’ll get to spray tan at least three to four people during your training! Make sure the program offers you ongoing support and business-building assistance. Many programs show you the basics of how to spray tan, but they leave all the hard work of setting up and marketing your business to you. That doesn’t seem right, does it? I didn’t think so and that’s why I created an entire Airbrush Tanning Bonus Pack to help you get started (more details on this huge booster to your new biz in a moment). 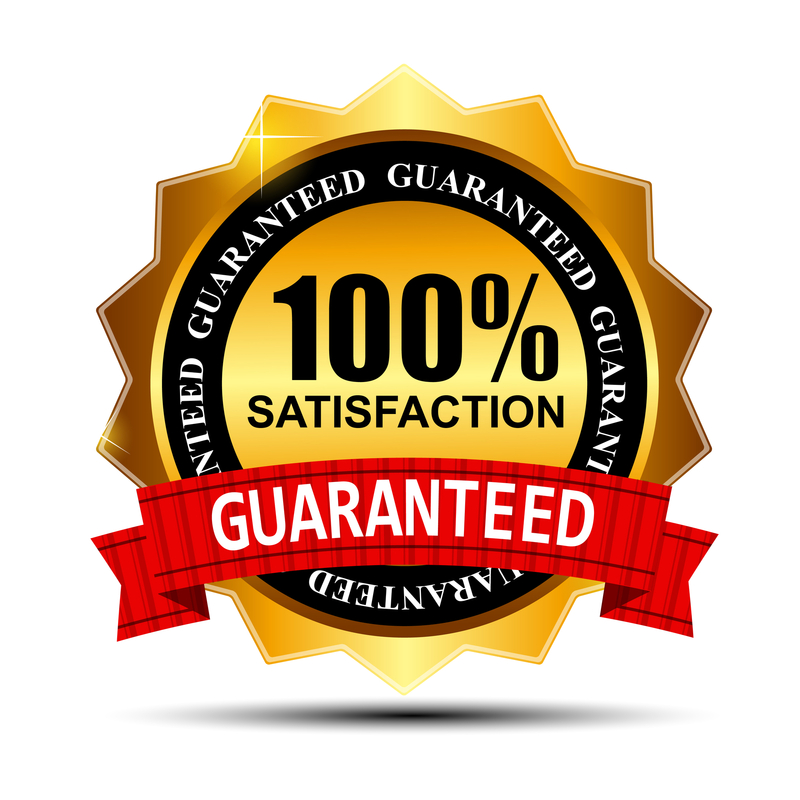 If you’re like I was, you’re fed up with all the so-called work-at-home opportunities for that guarantee success, but deliver nothing but empty promises. That’s EXACTLY why I created the definitive all-in-one one-day spray tan training that teaches you exactly how to start your very own successful Airbrush Tanning business in just a few short hours of intensive hands-on training. Unlike so many other training programs, I’m not interested in selling you expensive products or poor equipment that will just cut into your profits and are totally unnecessary for you to get started. That’s because at the Hollywood Airbrush Tanning Academy, I believe in supporting future spray tan business owners like yourself and have committed myself to providing the best training possible to give you the real boost you need to succeed. With my all-in-one training, 1-Day Airbrush Tanning Training makes starting your own airbrush tanning business fun and exciting … and profitable! Soon, YOU can be experiencing these same kinds of results! Now, you’ve already learned that you should only train with successful and experienced Airbrush Tanning Technicians like me, right? Plus, you’ve learned that you should only train with people who can demonstrate that they are running a highly successful Airbrush Tanning businesses right now like me, correct? You’ve had a chance to see my site and to read what my many satisfied students have to say … but what else is there that separates me and my training from the rest? I’m widely considered one of the leading experts on airbrush tanning in Southern California, the center of the airbrush tanning industry. People from all across the country come to learn my unique and flawless spray tan technique as well as my business-building methods. Click here to see a list of the hundreds of students. Many airbrush tanning technicians out there today do a fine job of teaching airbrush tanning, but offer no business support. 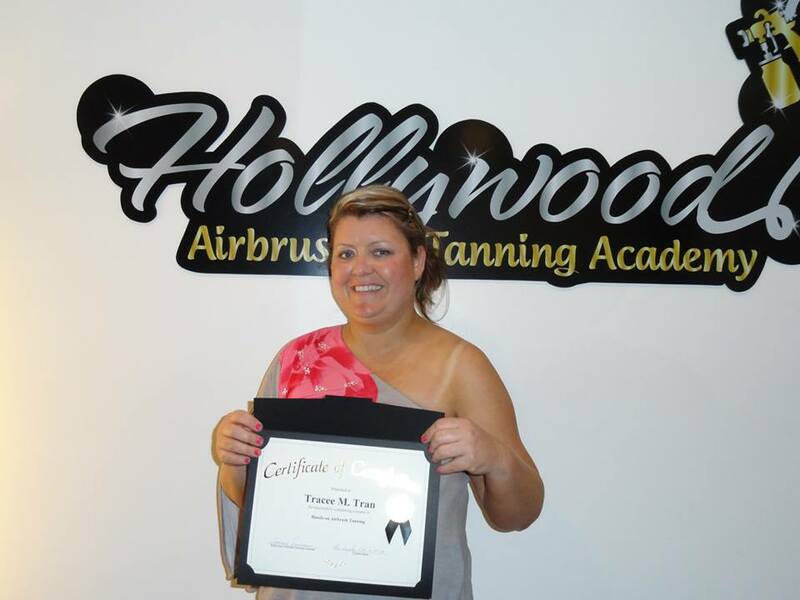 If you want to make it as an Airbrush Tanning Technician, you must learn the business behind airbrush tanning. Without this, you’ll never succeed. I have spent years learning everything there is to know about setting up and running a successful spray tanning business. During your one-day training, I’ll teach you exactly what you must do (and NOT do) to thrive! Airbrush Tanning Opportunities Are Everywhere! As an airbrush tanning specialist, you will be in hot demand! People everywhere are looking for well-trained airbrush tanning experts to give them the perfect natural-looking tan. Why? It’s because airbrush tanning is so addicting. It instantly hides skin imperfections (like cellulite, moles, freckles, acne, blue veins and more), makes your teeth seem whiter, makes you feel skinnier, and – as a result – it’s the ultimate happy maker! It’s the ultimate self-esteem booster! Your customers will be hooked and will return again and again. Plus, since you’ll be trained how to make them look amazing, all their family and friends will want to hire your services, too! You could very easily have more clients than you know what to do with (that’d a good problem to have)! Or, if you just want to tan your family and friends, you’ll be everybody’s favorite! And, you’ll feel so good because you have the satisfaction that you were able to make a difference in so many people’s lives. Making people happy is really rewarding! As you can see, the possibilities (and potential profit) of running your own airbrush tanning business are HUGE! In my 1-Day Airbrush Tanning Training program, I make sure you learn the best tips, tricks, tactics and techniques to spray tan like a pro. Starting your own airbrush tanning business takes hard work, but I want to give you the competitive advantage you deserve to make your dream job a reality. So, for a limited time only, I’m offering my newest trainees my complete Airbrush Tanning Bonus Pack. That means when you schedule your training today to discover how easy and affordable it can be to start your very own airbrush tanning business, you’ll also benefit from a series of bonus marketing benefits that are designed to help put you on the path to profitability faster and easier than you ever thought possible. Before-and-After Photos. I will professionally photograph all the individuals we spray tan together during your training. That means you’ll be able to instantly add these pictures to your website or use for Facebook or Instagram marketing. You will have full copyright to the pictures. Professional Portfolio Tutorial. During your training, I tell you exactly what you need to do to quickly and easily get a professional portfolio book created that includes all the pictures of your spray tan customers. So many Airbrush tanning businesses overlook this simple technique, but their loss is your gain. With a portfolio in hand, you’ll be able to easily present yourself professionally at hair salons, tanning salons, and spas to build your client base and referrals. Free Listing On www.HollywoodAirbrushTanningAcademy.com. As one of the highest-ranked Southern California spray tan resource sites on the web, my site generates a steady flow of business all across Southern California. As a student, I will list your site for free for six full months (if you choose, you can continue your listing for a nominal rate thereafter). Email-Phone Consultation for 2 month. When starting a business, there is so much to learn. That’s why I’m happy to offer you one-on-one consultation via phone or email after your one-day training to help get you started if you have any additional questions. I always welcome calls from my trainees and I will share all my trade secrets with you. When you sign up now, you’ll also get your very own copy of “Spray Tanning: Secrets from the Pro’s “… ABSOLUTELY FREE! It’s a great companion resource to your 1-Day Airbrush Tanning Training Program. With this great resource, you’ll get a firsthand look at what tools you absolutely must have to make it in the business. Written by top professionals in the industry, the book is packed full of lessons, techniques, client handouts, waivers, application forms and instructions for your customers, and so much more. The benefits from “Spray Tanning: Secrets from the Pro’s” alone are worth their weight in gold and it’s FREE for you when you choose to get the best one-day training available today. I’m happy to offer you the Airbrush Tanning Bonus Pack AND “Spray Tanning: Secrets from the Pro’s” as my special gift to you for signing up for your training today. Give Yourself The Head Start You Deserve Starting Now! Look, I know what it’s like when you’re first getting started – it can be scary, frustrating, and confusing. Personally, when I was just beginning I would have loved it if somebody took me by the hand and walked me through every step – from the very beginning to the moment I started making money as a airbrush tanning specialist … just so I could know I was doing it right! And, that’s why I’m so proud to be able to offer you access to this amazing one-day hands-on training program now. If this existed when I was getting started, I would’ve enrolled in a heartbeat. You’ll quickly learn how to master the fundamentals of every aspect of airbrush tanning. But, you’ll do it at your own pace and in a no-pressure environment. My goal is to equip you with the tools and knowledge you need to succeed. Period. I’ve designed every step of the training to help anybody quickly master the techniques and skills needed. "I love the technique and the fact that the feet and hands can be spray tanned. Living in Georgia, the people here don't spray tan the feet or hands and it makes for not a great looking tan. I also love the spray release technique that Simone showed us. It helps save money and keeps the overspray at a minimum"
I learned a lot from Simone. The main thing is that her spray tanning technique is different than anything else I found out there with very little over spray. She taught me a lot about the business end of it and shared lots of marketing tools. I could go on and on because there was just so much that I learned from training with Simone. She is amazing. I really appreciated learning how to choose the right color for a client based on their skin type. Learning the meaning of the DHA percentages was really important. Also it was so nice to be able to utilize Simone's machines and get a feel for the gun I prefer before actually purchasing one. The most important thing that benefited me while doing the training is the spray tanning technique. I find that the technique Simone taught us is different from techniques I've had done on me in the past. And this is one of the reasons the tans turn out so flawless. It doesn’t matter whether you want to earn some extra part-time income or become an airbrush tanning technician full-time. When you enroll today, you’ll permanently remove any uncertainty or fear of doing it “right” that you may have been experiencing. How Much Is It Worth To You To Start Your Very Own Airbrush Tanning Business? In business, it’s important to think about “value” before “cost” – you have to know how much something is worth before you decide how much you’ll pay for it. ​To schedule your training session immediately and begin taking advantage of the opportunities you’ll have as a airbrush tanning expert, you won’t pay $2798.00 You won’t even pay $1998.00. For a limited time only, when you sign up today, your hands-on training is only $1599. That’s a whopping 50% discount! If you’re not sure if learning the quickest and easiest ways to start your very own airbrush tanning business is right for you at this time, I’ve created a risk-free way for you to try it out with no risk. That’s right – enroll today to see firsthand how valuable this one-day hands-on training program is. If you are not 100% on fire and totally jazzed about your hands-on Airbrush Tanning Training, or if you are even the slightest bit underwhelmed, or if for any reason you decide you aren't completely satisfied, just let me know within 7 days after you complete the training, and I'll refund you your fees. No questions asked! I’ll be sad to see you go, but will gladly give you a prompt refund. Act Now Or Risk Missing Out! I want to be able to train people who are serious about becoming airbrush tanning entrepreneurs and are ready to take advantage of everything I’ve developed for you. "Student Testimonial on benefits of training received"
"There are countless benefits, I could write a book on it, but if I had to name my top two, then I would have to say that nothing can compare to the hands on training and spray tanning technique that Simone provides and teaches. Just due to that benefit on it's own, I know that I will be successful and be one of the best in the business. Nothing compares to the technique she taught me, and in addition sharing her own experiences and in depth knowledge of the business. I know that all my future clients will love every spray tan I give them - my first handful of clients all said that my spray tan was the best they have ever received - and I had just graduated from Simone's academy. Yes, I follow up on all my clients, just like I was taught to do. That to me says it all - the proof is in the pudding. The second benefit to me is that I clearly saved thousands of dollars avoiding having to blindly try out countless solutions, spray guns and equipment. Wrong choices of products and equipment, plus spray tanning inexperience would have surely cost me clients, but most importantly it would have destroyed my reputation, before the ink dry on my logo even had a chance to dry. I was taught what products, spray guns and general equipment to avoid, how to spray tan, why clients turn orange, how to market myself etc etc. I was spared the costly, potentially deadly trial and error phase and Simone is there for you to answering the countless questions her students will have after graduation. Anyone serious about opening a spray tanning business would be foolish not to get trained by Simone, or anyone of her qualified trainers. I invested in myself when I signed up with the academy, it was the best investment I ever made. If you want to be one of the best spray tanner's, then sign up with the Hollywood Airbrush Tanning Academy - My Mama use to say to me, "Don't be penny wise and pound foolish. "Simone is, to me, the Queen of spray tanning. "Where most training programs only teach you about one specific brand, Simone teaches you about all the available products and then has a support system through a Facebook group which continually gives assistances in general knowledge of sunless tanning. I knew right away that training with Simone was the right decision"
"I learned a lot from Simone. The main thing is that her spray tanning technique is different than anything else I found out there with very little over spray. She taught me a lot about the business end of it and shared lots of marketing tools. I could go on and on because there was just so much that I learned from training with Simone. She is amazing.."
"Simone was a wonderful instructor. She teaches her students her own custom designed spray tanning technique that leaves every tan looking flawless. This lets us stand out from other technicians. We are also trained on safety precautions. Simone doesn't try to sell her students on any specific product or equipment but teaches us about what's out there and lets us decide what we think is best for our business and our clients..."
Do you continue doing what you’re doing and “hope” that something’s going to work out differently than it has? Or, do you trust your gut, make the smart choice and start your future as an airbrush tanning specialist here and now? Schedule your one-day hands-on training today by calling me at (818) 674-9621 or emailing simone@simonesairbrushtanning.com. And, of course, if you have any questions, please feel free to call or drop me a line anytime. Or if you are ready to sign up, click that big button now and get started on the adventure of a lifetime! Become a certified Airbrush Tanning Technician in 1 Day - Guaranteed! I look forward to hearing from you and eventually training you! P.S. : Are you really ready to turn your back on success? Especially when you risk nothing and have so much to gain? Let me show you exactly what you need to know to start earning with your very own airbrush tanning business. I’m offering enrollment to you today for the low one-time price of only $1599.00. That’s 50% off the regular price. Act now to assure you take advantage of this amazing opportunity to start living the life of your dreams as an airbrush tanning business owner!